Is this the Samsung GALAXY Tab 11.6? Last December, we passed along some speculation that Samsung was working on a tablet with an 11.6 inch screen. The Samsung GALAXY Tab 11.6 was supposed to launch last month, according to the story, and would be Sammy's first model to be shipped with Android 4.0 already installed. Now here is where things get interesting. 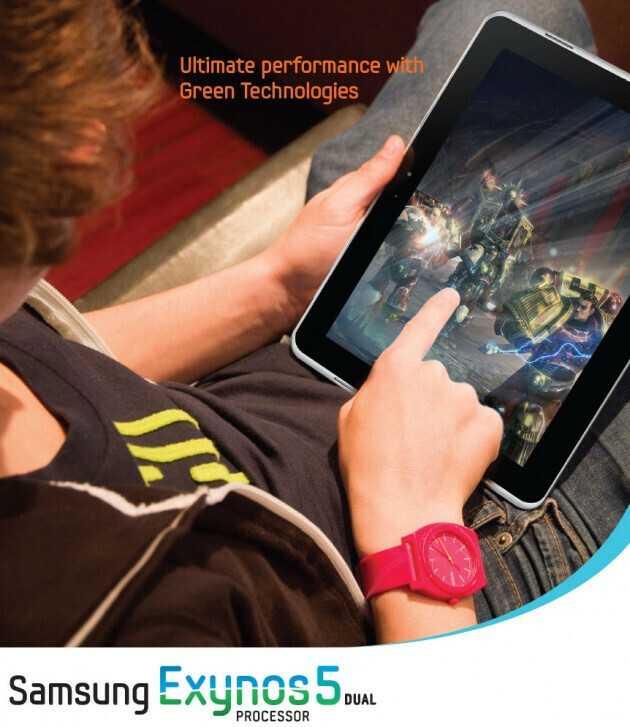 On Samsung's web site is an advertisement for the Samsung Exynos 5 processor and it shows someone using an unnamed Samsung tablet. Could this be the Samsung GALAXY Tab 11.6? On first inspection, it looks like the Samsung GALAXY Tab 2 10.1, except for the speaker grill and the coloring which are both different than what appears on a rendering of the sequel to the Korean manufacturer's 10.1 inch model. And the biggest clue of all is that the ad is for the very same 2GHz Samsung Exynos 5250 that is supposed to be under the hood of the GALAXY Tab 11.6. Other specs include the 11.6 inch display (natch) with a resolution of 2560 x 1600. The Pixel density of 260ppi would come close to the new Apple iPad's 264ppi and would be a Retina display. Remember, while the iPad's pixel density falls under the 300ppi benchmark once touted by Steve Jobs as being the dividing line for determining a Retina display, the fact that tablets are not held up to your face like a smartphone allows tablets to have a bit of a leeway. The screen would have a 16:10 aspect ratio. So is this the long awaited Samsung GALAXY Tab 11.6 or is the Korean based manufacturer just playing with our minds? Why are we talking about Apple? Can we concentrate on this beauty instead? Like I posted a few weeks ago, the only people more obsessed with Apple products than iFans are Fandroids. I mean you guys are consumed with their products. You can't even enjoy good Android news without talking about your obsession. Fandroids = closet iPhone/iPad lovers LOL! hopefully it comes out very soon. and hopefully the advertise it well. I hope arguments like "Samsung copying Apple again" stay away from this. There's no way. They had to have been developing this long before anyone saw the new iPad. Here's a question, why don't tablets come in integer sizes aside from 7 inches? Why the 7.7s and the 8.2s and 8.9s, and 10.1s? Is there a reason for this? some kind of convention I didn't hear about? If I had to guess, I'd say it had something to do with the ease of manufacturing the screens with the proper aspect ratios at that size, considering pixel size, etc. I could be completely wrong, though, as I don't have the first idea as to how screens are produced. Phone Arena I'm so disappointed with you, first of all, if the author of this post new more about what was going on in the rest of the world they would've realised that device is the Samsung Galaxy Tab 10.1N. The German version of the original Galaxy tab 10.1, it looks like that because thanks to Apple the German courts made them change the design of it, that is undoubtedly the Galaxy Tab 10.1N... Secondly that image on the right is not a rendering of the Galaxy Tab 2 10.1, but rather the Galaxy Tab 10.1 V, which was the original original Galaxy Tab 10.1 before the iPad 2 came out super thin and Samsung had to make their device thinner... Quite disappointing. @PhoneArena: "The Pixel density of 260ppi would come close to the new Apple iPad's 264ppi and would be a Retina display" THERE IS NOTHING CALLED A RETINA DISPLAY. IT'S JUST A MARKETING TERM COINED BY APPLE. IF YOU PATHETIC MORONS CAN'T UNDERSTAND THIS SIMPLE FACT, YOU ARE IN WRONG PROFESSION. DO I HAVE TO REMIND YOU THAT SAMSUNG IS "ONE OF THE MANUFACTURERS" OF THAT "RETINA DISPLAY". I WILL TELL YOU FOR THE LAST TIME -- THERE IS NOTHING CALLED RETINA DISPLAY. THAT IS JUST PLAIN OLD LCD. GOT THAT?? No, there is something called a Retina Display. It's a display that, when viewed at 12 inches (on a phone) the average human eye cannot discern individual pixels. The definition is changed for tablets. Obviously there is no difference in technology between it and lower ppi displays. Everybody realizes this, including PhoneArena,. Just because "Retina Display" was originally a marketing ploy by Apple doesn't mean it is of no value: it has become, at least in some circles, a colloquial byword for "very high pixel density," and can be used favorably for Android models as well (although Apple will sue you if they catch wind.) Also, using language like "pathetic morons," as well as typing in all capital letters, weakens your argument. So as not to sound hypocritical about commenting, I'd like to be the first to point out my error in placing an unnecessary comma after "PhoneArena" in the fourth line. I realize errors such as this could severely weaken my argument, as it looks like I haven't put much thought into my comment. Please, I beseech thee, accept my apology, and try to move on. "Average human eye" Define average human eye. What about inches? Have you heard about metric system? I thought people stopped using outdated systems 50 years back. Other people may refer to retina display as high PPI. It's not my problem that they are are so easily fooled. Do I want to be like them? Do I want to be part of that population who thinks Retina display is designed in Jupiter? Hell NO. Not my problem that they did not have proper education. BTW, as for my "my argument" being weak, who cares abt any statement in internet? I don't care what you think about so-called Retina. You think whatever you like, I just don't give a damn. The reference eyesight is 20/20 vision. Yes, I have heard of the metric system, but the United States of America commonly uses inches, and Apple is an American company, so naturally they would use inches. Also, how is thinking a Retina Display has high pixel density foolish? The iPhone had a higher pixel density than any other phone when it was released, and still maintains one of the highest densities on any phone today. Thus, it has a high PPI count. The same goes for the new iPad. If you think that most people are educated to believe that the Retina display is designed in Jupiter, then you yourself are very uneducated. Of course, I know you were using that statement as hyperbole, but from what I've seen, people seem to understand what exactly a Retina Display is. Maybe I associate with more rational people than you do. I care about several statements on the internet, as it is one of my primary means of getting information. From what I understand, this is the same with billions of other people on this planet. I think, and this is just my opinion mind you, that many people care about many statements on the internet. I hope that answers your final question. Even tech writers are obsessed with Apple. I also noticed "would be a Retina display". Honestly, even a layman like me knows "Retina" should only be used for apple displays as apple likes to be called (I do not find any problem in that as this is their marketing technique which is good) but I find it silly when tech writers use the same term for displays from other companies. Even Samsung doesn't use "Retina" for their displays who in the first place manufactures for apple :). I guess people are not ready to come out of their obsession of Apple and need to come out of the box which might take some time. Lets forgive Alan F for this one, I have read better articles from him. I accidentally posted the above comment as a standalone as opposed to a reply to rd_nest. Please disregard it, as I already re-posted it as a reply. It is kind of annoying that I can't delete comments, but I'm sure it's for the best or PhoneArena would let us. I think the term retina display has value. What else do you call a display where the pixels aren't visible when viewed from the average viewing distance? You can't just call it a high res. display or a high PPI display as that doesn't actually define any particular standard. So what is the industry standard terminology for a screen that meets the above criteria? To my knowledge, there isn't one, and hence we have retina display. It's no different to having industry standard definitions such as 'HD'. I get what you are saying, but retina is a little vague because it is different depending on the device you are using. Also, the argument about being able to discern individual pixels depends on the person. People with worse eyes probably couldn't discern a pixel on the iPhone 3g with HVGA res or even the GS2 with WVGA. It's all perspective. Really it's no less vague than 'HD'. To the average person, an HD display simply means something that offers better picture quality to what they are used to. This is broadly the same 'seal of approval' that Apple are going for with the term retina display. It's a damn sight easier (and a marketting boon) to say a device 'has a retina display' than it is to say a device 'has a display where, when held at the average viewing distance, you can't see the individual pixels'. isn't the actual ppi required to call a display "retina" based on the definition above much higher than 3xx?